I was born January 31, 1944 in Nagybecskerek (now Zrenjanin/Serbia) I am a self taught artist and by 1982 I have developed NAIVE STYLE. 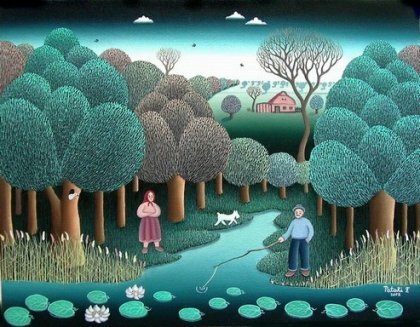 It can be said of Ferenc Pataki that he has develop his own distinctive naive style, and is best known for his country landscapes – which he paints as a means of escaping the harsh realities of city life. You can always pick a Pataki. If it doesn’t include his trademark motifs of three little clouds and three swallows ( because life is so beautiful) and one dead tree ( because the world is not yet perfect), then you know he didn’t paint it. Over the years Ferenc has received many awards and honors for his work and has been featured in many print and online publications. Ferenc Pataki has had eight solo exhibition and has participated in more than two hundred group exhibitions worldwide.